Corn season is here! It really starts feeling like summer once corn season comes around. When I was a kid we used to wait for Evans City corn. That was the staple of summer in suburban Pittsburgh back in the 90’s. Evans City had the sweetest, freshest corn and you could buy it on random street corners. It was pretty awesome. Now I wait until I see corn at the farmer’s market to know that summer has started. While I still like sweet corn, I prefer corn that is a little less sweet. I love getting it fresh because you can wait a few days before cooking it and it still tastes amazing. I hate getting corn from the store and the next day it’s mealy and gross. Since it’s summer and it’s hot outside I’ve been looking for dishes to make on the stove top. It’s too hot to turn on the oven and too hot to stand over the grill so the stove top (or a cold plate) it is. 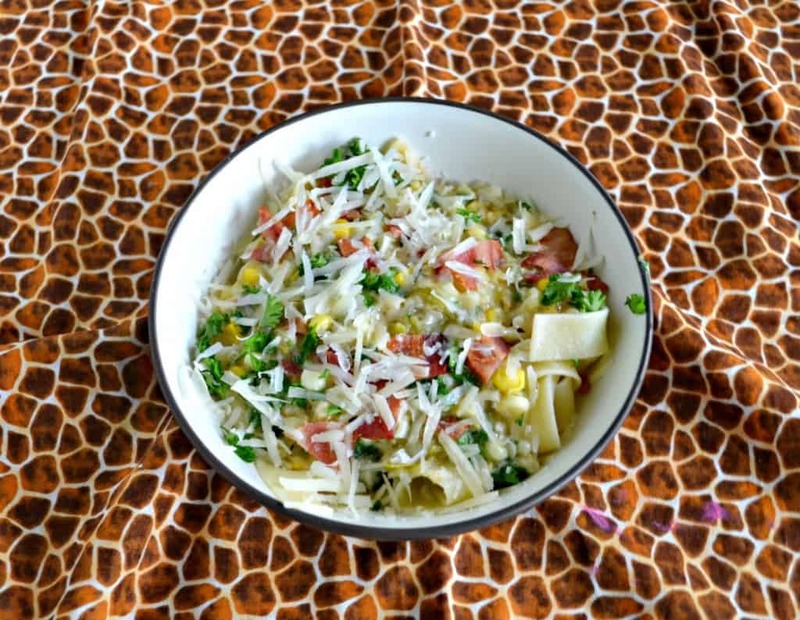 While I usually think pasta is too hot to eat when the temperature goes above 80 degrees this one is so fresh and tasty that it was the perfect taste of summer. 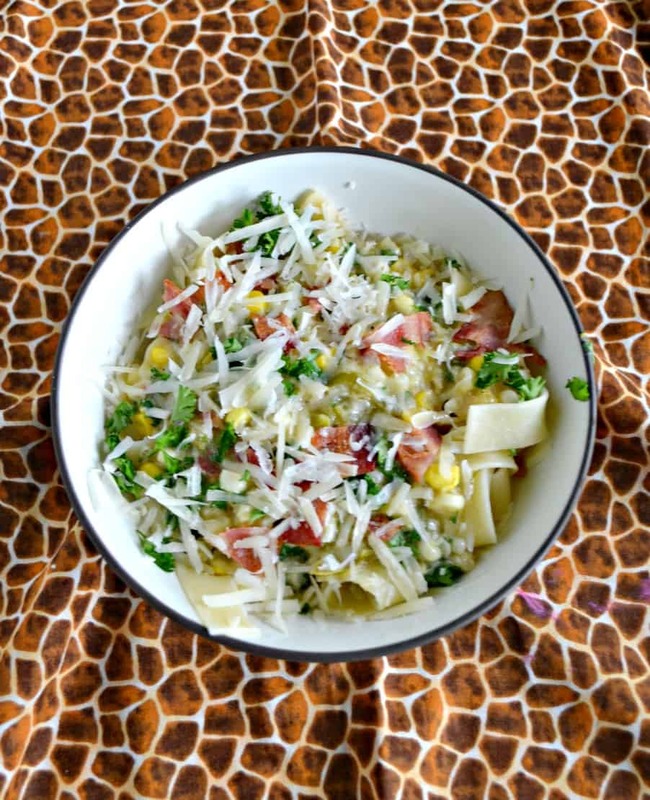 Corn pasta with Bacon and Pecorino Romano is bursting with flavors. It had a really complex flavor that came from the sweetness of the corn, the saltiness of the bacon, a sharpness from the Pecorino Romano, and a tartness from the lemon juice. The whole dish basically screams summer in your mouth. I made it with pappardelle pasta which was a good choice. The thick ribbons of pasta stood up well to all of the flavors in this pasta dish. I made a few small adjustments to the original recipe such as adding the bacon and also leaving more of the corn whole. I couldn’t see blending all of that delicious, fresh corn and it turned out leaving it whole was a great choice. We enjoyed this pasta with a side salad which made it hearty enough to be an entire meal. I like that it was quick and easy to make so I didn’t have to have the stove top on for too long. So if you are a fresh summer corn lover like myself get to the farmer’s market, buy yourself some corn, check out the other awesome #FarmersMarketWeek recipes, and make sure to try this dish while the corn is still in season! 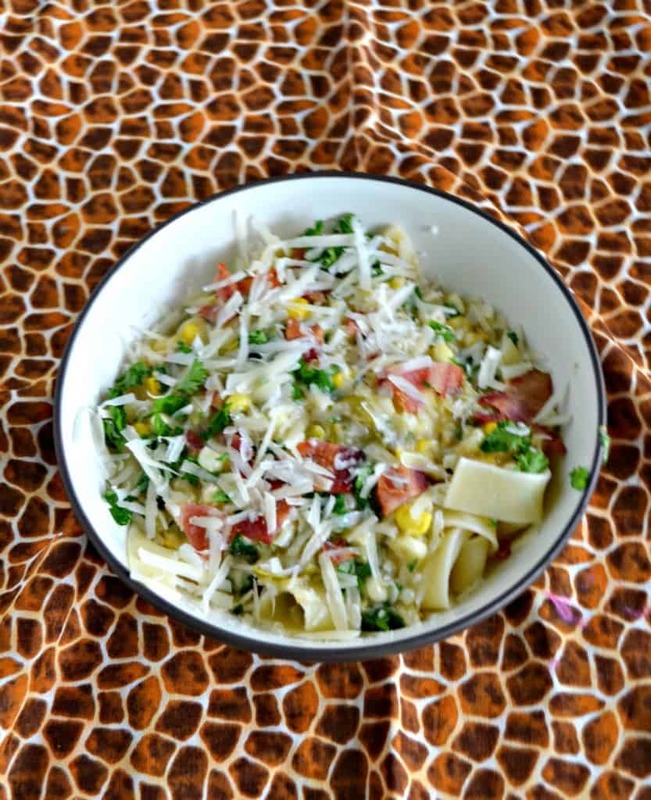 Fresh corn, salty bacon, sharp Pecorino Romano, and bright lemon make a flavorful summer pasta dish. Place the bacon in a large skillet and heat over medium heat for 5-7 minutes, turning twice, until browned. Remove to a paper towel lined plate to drain. Chop. Add the shallots, garlic, ⅓ of the corn, salt, and pepper to the pan. Cook, stirring frequently, for 5 minutes. Transfer to a food processor and process until smooth. In the same skillet heat the butter over medium heat. 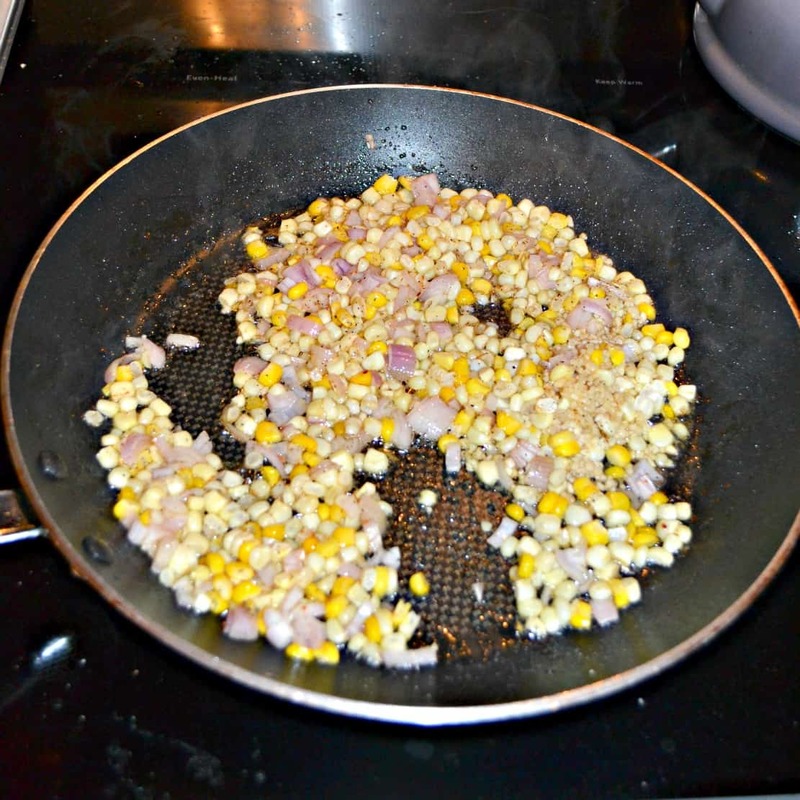 Add the remaining corn and cook for 3 minutes. Stir in the jalapenos, lemon zest, and lemon juice. 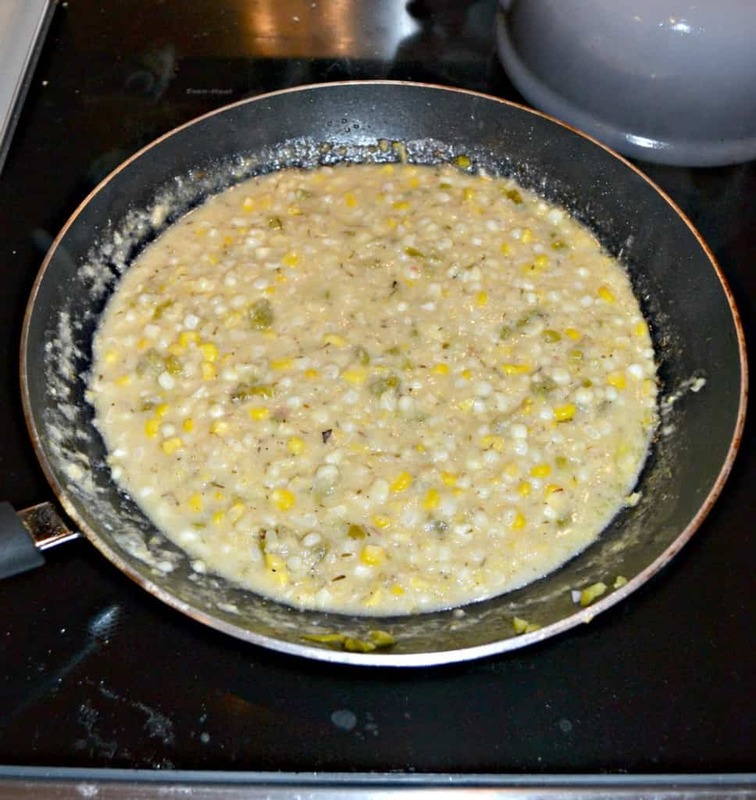 Add in the corn puree and bring to a boil. Reduce heat to a simmer and cook for 8 minutes. Meanwhile, cook the pasta according to the package directions. Drain, reserving a half cup of pasta water. Add the pasta water to the corn mixture and mix well. Heat for 2-3 minutes. Place the pasta in 4 bowls and top with the corn sauce. Sprinkle with bacon, parsley, and Pecorino Romano. Recipe adapted from Rachael Ray Magazine, July/August 2018.